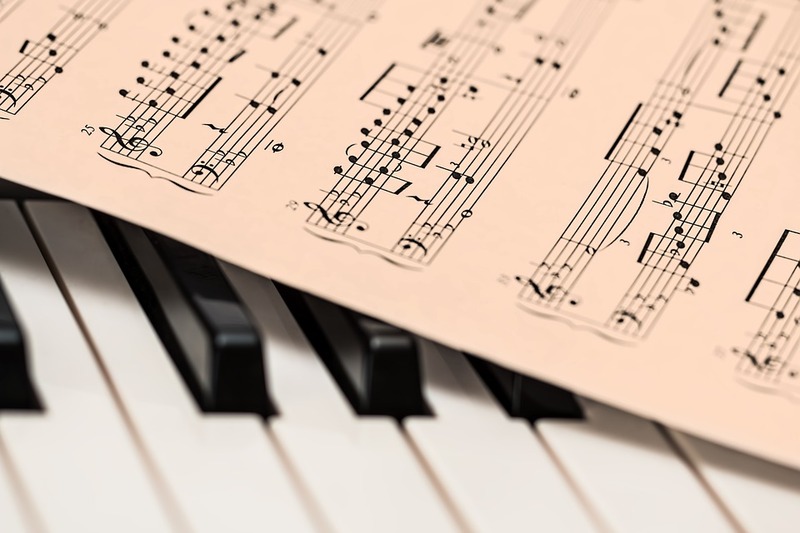 A musical performance review is a subjective and educated response to a musical performance. There are many musical performances and they always appear. We listen, we re-listen, we get pleasure, then something bothers us, we rush to find a new one, and we return to the old music albums. All this can influence us when we watch a musical performance, especially if it is our favorite singer or band. Many of us after watching a performance have a big desire to write a review on it. Today, we will tell you how to write a music review. A lot of people are interested in reading reviews on musical performances. Some even read reviews more often than they read books or watch movies. Most reviews are not so good unfortunately. The main purpose of writing a musical performance review is to show your attitude to the show, to present your opinion. Most writers are paid for good reviews, so it is a good chance to gain some money. Writing a review is always an attempt to express your attitude toward the performance. If someone writes feedback, then it will simply evaluate the performance in the context of like and dislike. The reviewer needs to deeply argue his/her point of view. The writer of the review interacts emotionally with the public, and therefore uses both everyday expressions and literary words. Now that you know the definition and purpose of the review, it is time to learn how to write a music review. Forget all photos and biographies of the artist. And if you do not know the artists yet, do not get acquainted before you write at least a draft. It is strange when in the review there is more talk about the fact that the vocalist’s appearance is not what it was in the 90s than actually about the performance. Do not read reviews for the performance that you are about to describe. Carry out preliminary work. Watch the performance which you will write a review on. Find out when and where it was already held. The performance itself is best visited several times to test your first impressions. Get a notebook and a pen. You can make some notes while watching the performance – it will be useful for your future writing. Making notes in the dark is not very convenient, but this is a necessary part of the work. Draw how the scene looks, write down the songs you liked, and note all your impressions that arose during the performance which can later be forgotten. Returning home, it is better to immediately “decrypt” all the hastily made notes. Do not rush to write a review. Within a few days, go back to the performance mentally, and compare the first impressions with the aftertaste. After that, you can start to write the text itself. What is the subject of analysis (artist or band; when and where the performance was held)? Is the review relevant? Express why you decided to write it. What are the main points of the performance? What are your feelings about the performance? What are shortcomings of the performance? Did the artist/band communicate with the audience during the performance? How? Provide brief information about the performance, the artists, and their past performances in the first part of the article. Write an analysis of the ideological content. Think about what thought the artists wanted to convey to the audience, and what was the atmosphere at the performance. Analyze several important songs, note the original director’s decisions and the singers’ presentation. Give arguments regardless of whether you praise or scold. It is very important to keep objectivity, even if you did not like the performance as a whole. In any performance, you can find positive aspects. Evaluate the vocal performance. Don’t forget to indicate the names of the singers who performed. It is not necessary to list in detail all the singers. Talk about the color solutions, light scenarios, and how the form helped to disclose the content. It is worth giving a few words to the work of the choreographers, costumers, and make-up artists. Try not to compare the performance with the previous ones. It’s very easy to write that this performance is like the last one. Write about the music, write about the lyrics. Give a chance to new watchers to learn about the new performance, as something direct, and not through the prism of your brain. We’ve read a lot of reviews that almost entirely consist of comparisons. The exception to this rule is if the performance is frankly a weak presentation of old hits. Although this is also very subjective, as many conservative people refuse to accept something new and prefer old hits and performances. It’s just not right to compare the “quality” of the new performance, which you watched once or twice, with an old one you watched 200 times since the age of 14. Watch the performance carefully. Write about it without prejudice, as you would something new. How do you like reviews such as, “Good old AC/DC (or Motorhead, Offspring, etc.) presented a new performance! And that’s it, no one expected surprises”? Probably before making such a “review” the author did not bother to watch the performance even to the middle. It’s good, when it is not added to this, that the performance is certainly much weaker than the previous ones (see the previous rule). Write about music. If you did not listen and watch everything, do not sit down at the keyboard – do not disgrace yourself. Before you start writing a review, it is necessary to read through musical performance review samples. By reading through our sample analysis, you will see that the author didn’t simply retell the events of the performance, but made a thorough analysis of it. 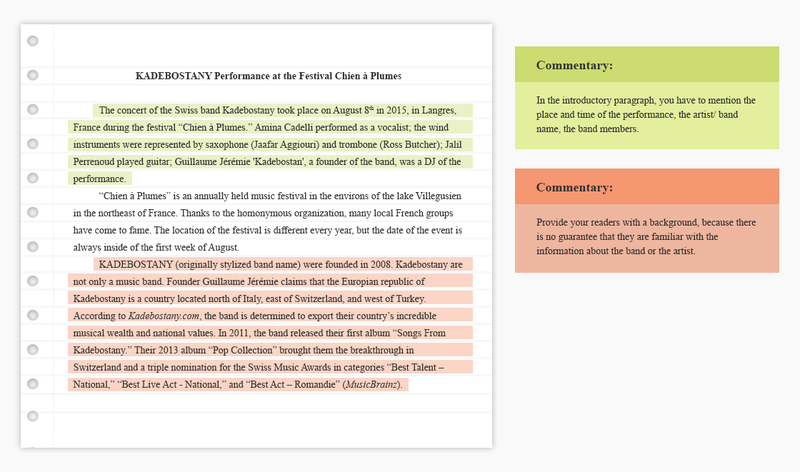 If you look through our musical performance review sample, you can write your own review much easier. The style of writing text is arbitrary. Evaluation of work involves not only an analysis of the main points, but also the argumentation of your point of view. Finished work either remains in electronic form or printed. The review contains an assessment of the positive aspects of the performance and an indication of errors. The review is usually written on new and relevant performances, or reflects a modern look at the classics. It is important to distinguish the performance against the background of the others, to understand its distinctiveness and individual style. In order not to have problems in creating a review, you can use a simple plan that will direct you on the correct way and help you to express your opinion competently. A review is a civilized form of discussion of something, which is the analysis and evaluation of any work. The review is a genre of literary criticism for newspaper and magazine journalism. But recently the skills of creating reviews should be owned by virtually everyone, because every day hundreds of thousands of people express their opinion about certain things and events. You can review almost everything: home appliances, accessories, computer technology, music, photos, films, computer games and websites, artworks, recent events, incidents, and political statements. In short, anything that interests you can be subjected to a rigorous assessment, which should determine the value of the object. As a rule, the review is written in a journalistic style, is polemical in nature, and can also gravitate towards the genre of the essay, of literary criticism. It should be objective, therefore it does not allow the use of personal emotionality, rough comparisons, or the presentation of subjective thoughts. All expressed judgments should have clear arguments (examples from the performance). The writing of the review involves the use of terms in the sphere of music, to which the analyzed performance belongs. If you write a review for the first time, this may seem very difficult for you. You should clearly understand what audience will read your review. Determine which style of writing is more suitable for your review. The topic of the review is an important element. If you were given a ready topic, consider the title, and understand the meaning of what you will write about. Draw up an outline of the article and determine its structure. Remember that any text must have a beginning and a logical conclusion, and events, facts, or any other information should be stated sequentially. If it is difficult for you to formulate at once what the review is about, start writing it from the main part, and add the announcement or introduction at the end, when the finished text will be before your eyes. When writing a text, remember that sentences in paragraphs should be related to each other in meaning, and each new paragraph should logically follow from the previous one. If you refer to historical (political, economic, and other) events and facts in the article, use the dates, and do not be lazy – double-check the reliability of those facts about which you write. If you mention an internet resource in the text, specify its address or the exact name, so that the reader could find it on his/her own. Write a conclusion if required. Write an introduction (or announcement) if you have not written it yet. Re-read the finished review several times, checking it for grammar, punctuation, style, and other errors. Execute (if necessary) the text on the page in accordance with the requirements (set the width of the fields, align the text, highlight paragraphs with indents). – A frequent error in writing a review is its detailed retelling. The review immediately becomes uninteresting to the reader, and is recognized as weak. Do not write a retelling instead of analyzing the text. – It is silly not to pay attention to the title of the text, because it tells about the deep meaning of the content and may include a number of metaphors. It is worthwhile to understand why the author put exactly this title to the work. – Also, a frequent mistake is the confusion between a review and feedback. Feedback is a general assessment of something with practical recommendations, while a review is a detailed analysis. – The reviewer should not overload the work with insignificant details. Create a short and informative review. The position of the reviewer should not be blurred. If you have any difficulties in your work, do not despair. Use the materials on how to write a review (an example of its analysis is given in this article), and you will significantly improve your reviewing skills. Now you know how to write a music review and it will not be difficult for you anymore. The review should be devoted to the particular performance and should be written according to the guide we have presented. To write a high-quality review, it is necessary to understand what the authors of the performance wanted to demonstrate to the audience. For getting addition help, you can read through samples presented on our site. Our guide will help you to write an art review correctly. Good luck with your writing!